4,180-passenger floating city, and rightly so! These are the 5 things about the Anthem that I appreciated the most! I have to start with the check-in method because with a ship that holds 4,180-passengers, one would naturally expect to be standing in line for quite some time. Well, that just isn’t so! Prior to sail date be sure to complete your online guest registration inputting info like your passport number, emergency contact, etc. Then upload a photograph that can be used as your security image. Yes, anyone, even I can follow the simple instructions. Upon arrival at the pier you are greeted by roaming Royal Caribbean staff armed with iPads who scan your pre-check in form and wave you on to the ship. You pick up your Sea Pass card at your cabin. Easy peasy! I love the new flexible dining that is available on Anthem of the Seas. Last year there was so much dissatisfaction with the Dynamic Dining program aboard Quantum of the Seas (sister ship of Anthem) that it overshadowed an otherwise amazing cruise ship experience. Well, thank goodness they cleared that all up! On the Anthem guests can choose from Dynamic Dining (where you can dine when you want, where you want, among 4 included restaurants) or Dynamic Dining Classic, a more traditional fixed seating option but still with access to the four eateries. Each of the complimentary restaurants, American Icon Grill, Chic, The Grande and Silk offers a different cuisine, from contemporary American to pan-Asian. There's also a wide array of extra-charge restaurants onboard. The SeaPlex is amazing and unlike anything else I have ever encountered at sea! Its an indoor sports center with a rink where at alternative times you can smash into fellow passengers on bumper cars, shoot hoops, play volleyball or go roller-skating! It even features a circus school where you can fly through the air on a trapeze. 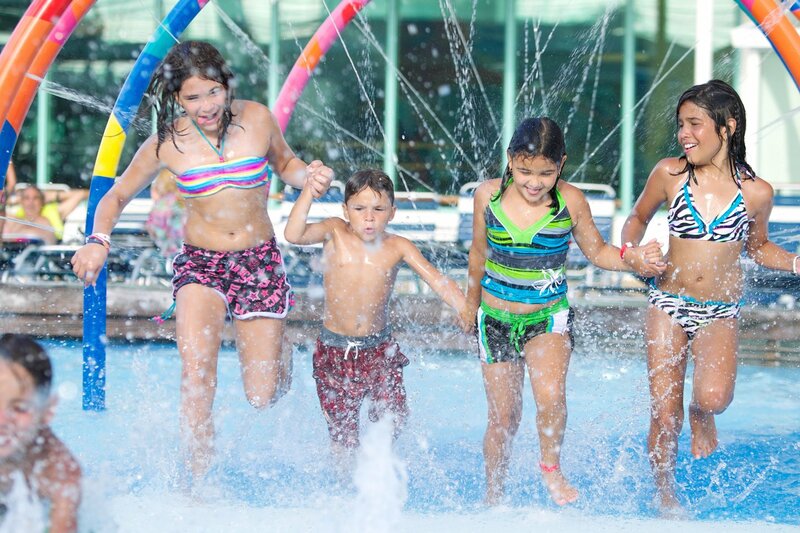 This is a family friendly complex, so kids …bring your parents and share the fun! While I certainly respect anyone who can totally “disconnect” from texting, emailing and social media while on vacation, unfortunately neither my husband nor I can! That’s why I loved the very affordable and fast Voom high speed Internet! For just $15 per device, per day, you can stay connected without the lethargic Internet speeds traditionally found on a cruise ship. Lastly, I loved the pool area on Anthem of the Seas! There are 3 pools as well as the H2O Zone, dedicated to families with young children. It’s especially nice that there is a pool aside from the adult-only solarium pool that has a retractable roof! Good planning since the Anthem leaves from the northeast and aside from the summer months, the weather is otherwise too cool for outdoor swimming! Honestly, I can go on and on about the attributes of Anthem of the Seas but wouldn’t you rather discover them all for yourself? Anthem sails year-round from Cape Liberty in Bayonne, N.J. She will make winter trips to the Caribbean, spend the spring and summer season cruising to Bermuda and during September and October, she will sail to Canada and New England.